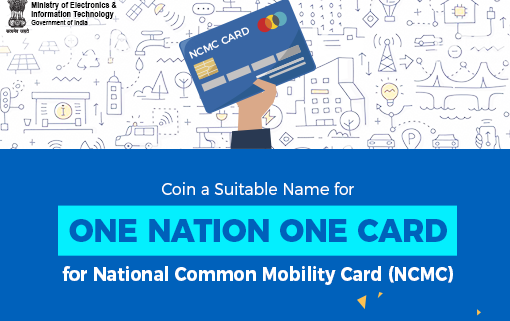 NCMC -What should you know One Nation One Card? National Common Mobility Card (NCMC), commonly known as One nation one card is a single card that can be used for doing various transactions. The card was launched by Prime Minister Narendra Modi on 4th March, 2019 at Ahmedabad. This card is supported by Indigenous Automatic Fare Collection System (SWEEKAR) and SWAGAT. The card will benefit millions of travelers in the country. With this facility, India’s dependence on foreign technology will be ended. This card is similar to a debit-credit smart card issued by a bank with some special features. All the newly issued debit and credit cards by banks will now have NCMC feature that can be used to travel in Metros in any part of the country, including Delhi metros. This card is a ‘made in India’ initiative and is developed by National Payment Corporation of India (NPCI) and Ministry of Housing and Urban Affairs (MoHUA). One Nation One Card, the inter-operable transport card can be used all over the country. A customer may use this single contactless smart card to make payments across all segments including metros, bus travel, suburban railways, toll taxes, parking charges, and also for shopping at retail store and merchants. National Common Mobility Card (NCMC) also allows the cardholders to withdraw money and to book monthly passes and season tickets. This card is valid in various countries like Singapore, Paris, London, Sydney, Melbourne etc. The smart card also has a “unique stored value” feature that can be used to make digital payments in offline mode along with ensuring minimal financial risk to involved stake-holders like banks or merchants. Hence, this card supports both offline and online transactions. One nation one Card, being an open loop smart card, allows its holders to avail various benefits such as loyalty points and cash back from partner banks as they get in Debit and Credit card. The card is secured with EMV (for Europay, MasterCard and Visa) Technology, and thus, every transaction done with this card is safe and secure. This card aims to make the payment system easier for all modes of public transport in the country and promote hassle-free and seamless transportation by eliminating various travel related issues such as waiting in a long queue for getting tickets fishing for changes, and carrying cash etc. The card is beneficial for both consumers and operators and helps to improve the efficiency of daily operations by saving a lot of time and efforts. As the card is similar to Rupay debit and credit card issued by the bank, so anyone can get this card by contacting their bank as this card is now available with almost 25 banks as debit, credit or prepaid card and the card can also be issued from PayTm Payments Bank. https://www.knowinfonow.com/wp-content/uploads/2019/03/NCMC.png 340 510 Publisher http://www.knowinfonow.com/wp-content/uploads/2016/06/logoik-e1482386591353.jpg Publisher2019-03-28 12:26:232019-03-29 13:11:49NCMC -What should you know One Nation One Card?